I’m currently sitting at the SFO Airport and waiting for my flight back to Sydney. In my bag I have the accepted job offer from a Silicon Valley company, but it’s not the offer I got from Apple. “How is that possible?” you ask. Isn’t it the dream of every iOS developer to work for Apple? Let me tell you my story. Recently I moved from Germany to Australia for work and fun. 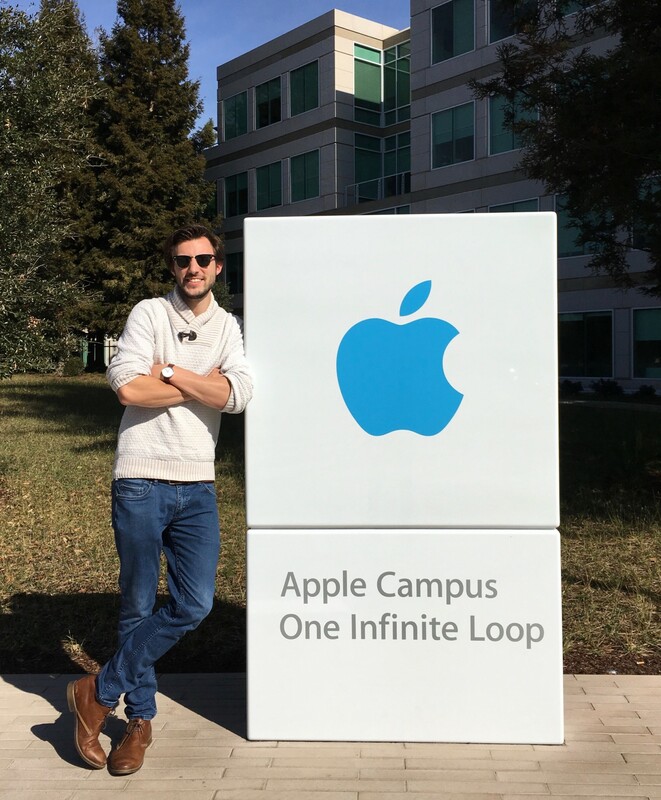 While I was there, I got a LinkedIn message from an Apple recruiter asking if I wanted to talk with him about opportunities at Apple. “Hell yeah,” I thought and so we had a call about my current situation and what Apple was looking for. That was early November. The interview process worked like this: You send over your CV, the related teams at Apple screen it and if they are interested in you, the team’s HR person will contact you to set up phone interviews with team members. My CV aroused three team’s interest. I finally had phone interviews with two of those teams (the third team took an internal employee). The phone interviews took place from mid November to mid December and were challenging and interesting. I had a very good feeling afterwards and both teams gave positive feedback that they wanted to invite me to Cupertino, that was just a few days before Christmas. That was a really nice Christmas gift I can tell you. It took them one month to schedule the on-site interview. So I got noticed about the interview schedule one week before the interview took place and four days before my flight from Sydney to San Francisco departed. That was quite a short period of notice but hey it’s Apple I thought. Apple paid for the flights, the hotel in Cupertino and a rental car. The on-site interviews took place during the last week of January 2016. I can’t talk about the details of the interviews because I signed an NDA. So all I can tell you about is the structure of the interview. I had two days with five hours of interviews separated into 45-minute slots. Altogether that was six talks with one to two people from the team a day. That was quite exhausting I can tell you but the questions were interesting and the people were very nice and smart. What I haven’t told you yet is that I applied for several other jobs in the Silicon Valley right after I got the positive feedback from Apple that they would invite me over. So I had multiple phone interviews with various companies. One of them was Yelp. Yelp had a very streamlined process and after one phone interview with them we scheduled an on-site interview in San Francisco after my interviews with Apple. You could think, “What a traitor. Apple pays for your flights and everything and you start to talk to other companies.” Let me stop you right there. Apple never guaranteed a job, so I had to look out for alternatives. They have the right not to give me an offer and I have the right to look for alternatives. Fair game. The on-site interviews with Apple and Yelp both went very well. The second team at Apple I had an interview with gave me positive feedback very quickly but it took the other team three weeks to provide negative feedback. Yelp also gave positive feedback and the process was very streamlined again. I got the feedback and six days after the on-site interview I had a job offer letter in my hands. So the interview at Yelp was later and they were able to provide a job offer letter earlier than Apple. The job offer letter from Yelp had a deadline. That’s why I told Apple to hurry with their decision-making process and one day before the deadline they finally gave me an offer. The offer was comparable to Yelp’s offer. You are not able to publish your own apps in the App Store (http://www.tomsguide.com/us/Phillip-Shoemaker-App-Store-iPhone-iWiz,news- 7813.html). You are not able to publish articles or speak at conferences about any iOS-related topics (https://ashfurrow.com/blog/my-job-interview-with-apple/). The adoption of Swift will not happen soon (see https://daringfireball.net/thetalkshow/139/federighi-gruber-transcript). Technical Reason #2 (under NDA). The commute to Cupertino (I just visited SF and saw how awesome it is). In the end it’s a giant company (the process from initial contact to offer took more than three months) with all its downsides. So in the end it was these concerns and my gut feeling that let me think that maybe Apple wasn’t the best option for me right now. An interesting product to work on that I’m passionate about. The possibility to adopt new technologies sooner than at Apple. The ability to publish articles or speak at conferences about iOS-related topics. I can publish my own apps (which are not competitive with Yelp of course). It is located in SF. I’m flying home with an accepted job offer from Yelp and am looking forward to living and working in San Francisco soon. This has been a few months ago now and some of my friends still don’t understand my decision, mainly because Apple is still that magical creator of top-notch products for them. What happened to me after the interview marathon was: I realised Apple is just a company like any other company. Of course they have awesome products but behind the curtain it’s just a big company and a company of that size is not for me right now. Mobile expert with a passion to develop mobile strategies and create, improve and market mobile apps. Focus on iOS.